One could spend hours just watching how spectators - from very young to very old - interact with the various ways artists are manipulating light, creating illusions, curiosity and unforeseen reactions. Light has always been essential to art. For example, during the renaissance painters were exploring the chiaroscuro, the contrast between light and darkness, an illusion of volume and perspective. 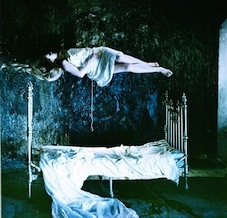 Later on, moving images took up this notion as well, exemplified by film noir or in the use of white ‘veils’ by Ingmar Bergman or Andrei Tarkovsky. 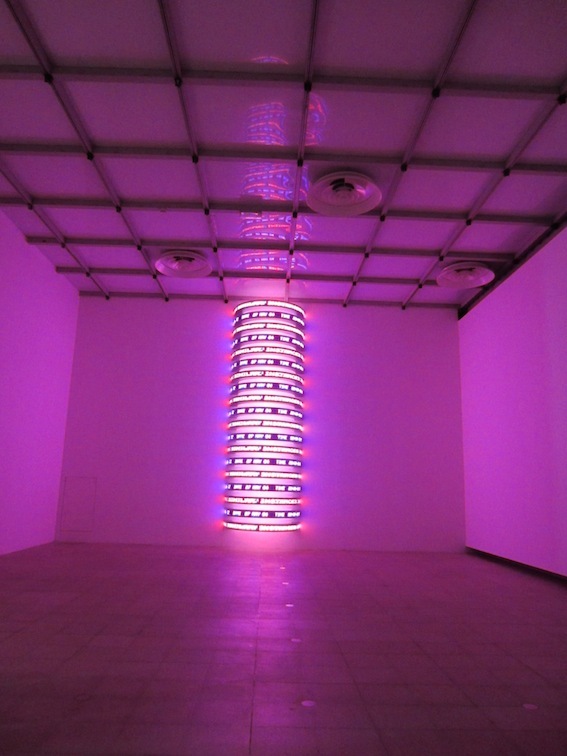 The light show offers a succinct retrospective on the use of artificial light by 22 artists since the 1960s. Exhibits include static and dynamic forms, various ways of involving the viewer, a vast range of technical knowledge underlying some of the installations, and fascination with immateriality and make-belief. Light is life. Without it we could not exist. Humans always depended on daylight, from early days slightly extended with oil lamps, candles and the like. Electric light changed all that, and power cuts demonstrates how frail our dependence on artificial light and power has become. Not surprisingly, artists were intrigued by artificial light, its use by, and effects on society, but also its power of affecting perception, playing with our senses and minds. Like all art, working with artificial light can evoke political messages. This is exemplified by Henny Holzer’s ‘Monument’, a sort of American equivalent of French ‘colonne Maurice’ with moving LED word strips made up of declassified US government documents on the ‘war on terror’; also, very disturbingly, by Ivan Navarro’s ‘Reality Show’, inspired by repression in Chile, consisting of a glass box with one-way mirrors which gives those in it the sensation of bottomless gulf below and endless space above created by infinite reflections while blotting out their own reflection. 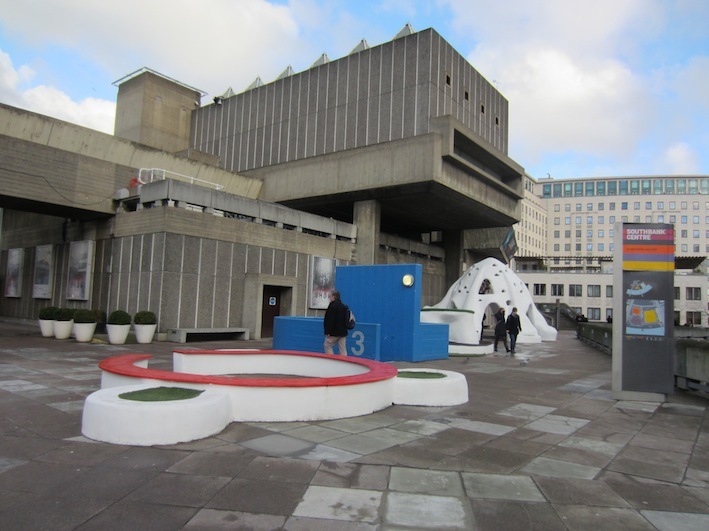 Whether the effect was intended or not, the first impression when encountering the light sculptures in the brutalist, raw concrete space of the exhibition venue is truly magical. Leo Villareal’s vast, cylinder of moving, sharp white LED lights, creating an illusion of weightlessness, is reflected in the glass parapet of the ramp which is leading to the upper level where Cerith Wyn Evans’ ensemble of three rotating cylinders, made up of moving tungsten light ribbons, reflect their golden warm light onto the parapet and the LED cylinder in turn. 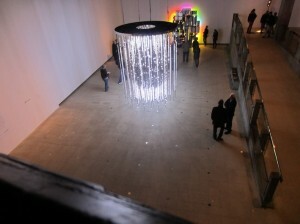 Depending from where the exhibits are viewed, the third large piece by David Batchelor, made of discarded light boxes turned towards the wall and reflecting a wide range of colours from there behind a black silhouette of cable guts, is vaguely visible through the volume created by the irregularly moving white lights. A truly ‘Magic Hour’, as Batchelor calls his work. 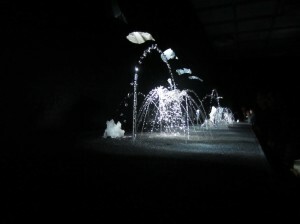 At the top of the ramp, Ceal Floyer’s much smaller work is halting the visitors in their stride as they are tempted to put their bodies between the light source and the blotch it creates on the concrete floor, but not succeeding immediately as the projection does not correspond to the viewer’s expectations. Francois Morellet’s elegant and by now classic work made of neon tubes would have been noticed better outside this (un? )voluntary interplay between the other exhibits. The other work which stood out among the well selected and representative exhibits by European and North American artists was Olafur Eliasson’s model for a ‘Timeless Garden’. 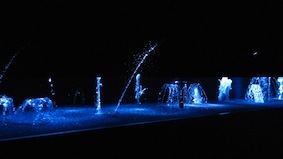 It consists of 27 different fountains illuminated by intense white strobe lightingm with a continuously changing effect which transforms the moving water into crystal-like beads and opaque ice-like sculptures adopting different colours. Again,s truly magical and essential as it is composed of water and light, sources of life. Finally, compliments to the author of the succinct and informative guide to the exhibition, well worth seeing and returning to.